Google is out to tame the Wild West of the food world, and I'm not really sure how I feel about this. A couple of weeks ago, Google introduced Recipe View, a search function Bing had added last year. Initially, I loved the idea that people would be able to search for recipes exclusively and that Google had taken the time to create a recipe search tool specifically for cooks, but then I saw the search results and my hopes deflated. I was disappointed to see that although larger recipe food sites are well represented, nary a blog post was listed for the many searches I initiated. Allrecipes.com, Food.com, the Food Network, About.com and Epicurious made up the majority of search results, while blogs -- both well-known and obscure -- seemed not to have been invited to the party (yet). The whole point of Google's new recipe search is to allow people to designate what they're looking for in a recipe, which in turn limits the search to recipes only. So if you're looking for information on "sardines" you will end up with just recipes instead of a Wikipedia entry plus a bunch of shopping results. 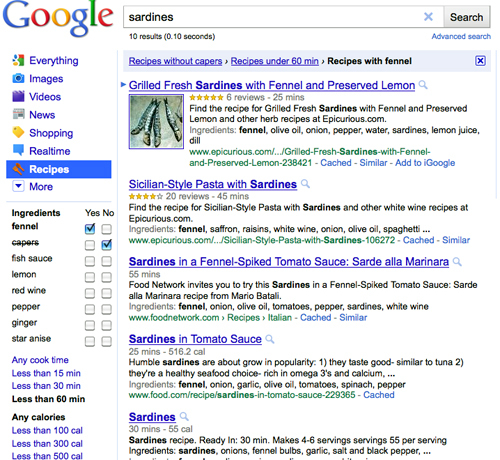 Google Recipes also allows you to limit your search by ingredients (do you want to cook your sardines with fennel and without capers, just check the boxes on the left side of the page), cook time (less than 60 min. ), and calorie count (any calories). Helpful and fantastic, right? Yes, but recipe blog posts that might rank high in Google's Everything search due to popularity are not likely to be there. Not yet. "It's going to favor some of the biggest sites and those who have optimized their content to be found easily by search engines. Expect a lot of FoodNetwork.com and AllRecipes.com recipes to pop up on the first page of any search." So, how do blogs get included? In order for a site's recipes to be indexed by Google's new recipe search they have to meet some specific and not-so-specific criteria. Google's Recipe Search and Rich Snippets Elise Bauer (simplyrecipes.com) at Food Blog Alliance. Simply Recipes recipes are showing up in the Google Recipe search so she clearly knows the scoop. Making Microformats Manageable: The New RecipeSEO Plugin Allison Day (recipeseo.com) at Food Blogger Forum. Here is the direct link to her WordPress plug. Basically, you should know that recipe data now has to be marked with specific tags so Google's search engine can recognize the information as a specific content type namely, a recipe. Right now, doing this takes time and some coding knowledge, which is a pain, but doable. Hopefully, this process will get easier as more editing tools become available to bloggers. Google suggests you fill out this Interested in Rich Snippets? form to alert them that your site is now using the required markup code and should be indexed by Google Search. You are required to submit four examples of pages that incorporate rich snippet code and have been validated using the Rich Snippets Testing Tool but it is not clear how much of your site needs to be compliant or how long it will take in order for Google to start displaying your results. "Note that there is no guarantee that a Rich Snippet will be shown for this page on actual search results. For more details, see the FAQ." This FAQ seems like an earlier version of the information displayed on the page "Rich snippets not appearing" since the FAQ page does not mention including recipe sites being eligible for rich snippets. So, even if you go through the process of tagging and validating your recipes you are not guaranteed that your posts will display as Rich Snippets which I am guessing means that they may or may not show up in the Google Recipe Search. So, you are left to wait and see. Maybe I'm suspicious, but what seemed like a cool idea -- a search tool that enables readers to quickly find recipes -- now appears to be a tool catering to larger company sites and I'm concerned about what this means for food bloggers. It seems that many established recipe sites started incorporating the markup to generate rich snippets once they were aware of Google's plan to develop the Recipe Search but the urgency to start using microformats did not appear to reach the blogger community. The lack of integrated and easy to use plugins for the various blogging platforms speaks to the absence of this necessity. Elise Bauer points out the irony that Blogger, Google's blogging platform does not have tools developed for recipe markup that would help bloggers generate rich snippets. Okay. Whine whine, gripe gripe. Poor bloggers. But what about readers and cooks? How does Recipe View change their experience? The average recipe seeker may be unaware of the filtering that is currently going on and miss out on much of the user-generated food content that has accumulated on the web over the years. On the other hand, it will provide a faster and more efficient system to access information they are seeking without having to manipulate their queries or apply advanced search techniques. Regardless of the effect on my posts, as a reader I'm a bit frustrated that I may lose out on seeing an innovative recipe with a great story, which is why I read blogs in the first place. I love reading about David Lebovitz's various forays into Paris bakeries that end with a lovely tart recipe, or getting inspired to try making a Death in the Afternoon cocktail after giggling over one of Michael Procopio's pieces. I should note that many major sites with extensive recipe collections (but are not exclusively recipe sites) are also not yet displaying in Google Recipe View. For instance, I haven't seen any New York Times recipes listed (by them) and I am curious about how large sites that have food as a topic area and a wealth of recipes are approaching the situation. Maybe this will all work itself out soon. The problem, however, is that bloggers and readers alike have now come to expect immediacy. When I post a recipe it shows up without any delays and people can read it. You can twitter about it and the information is distributed without a waiting process. Perhaps we all need to just learn (or relearn) to be patient again and this post is the equivalent of Chicken Little yelling that the sky is falling on food bloggers everywhere. So although I'm finding the new Google Recipe View a bit frustrating, it may not be elitist. I'm keeping my fingers crossed that it ends up being inclusive and helpful in the end.